NASA’s Universe of Learning supported Columbia State Community College’s Pryor Art Gallery as it hosted the LIGHT Beyond the Bulb exhibit Aug. 17 – Sept. 22. A public reception was held on Sept 7 featuring local Tennessee artists John Wilkison, Barry Donaldson, Craig Lackey, Marian Gizzi-Haynes and Coco Dauer exhibiting interpretations of light in oil, acrylic, watercolor and other mediums for a STEAM event alongside the science exhibit. Columbia State hosted Kim Arcand (Chandra/SAO) for a talk on Sept 7 after the artist reception, which was attended by about 100 members of the public. The Smithsonian Astrophysical Observatory conducted an intensive program coding session with high school students at Akamai Boston on August 2. Students were introduced to the electromagnetic spectrum, NASA’s Chandra X-ray Observatory, NASA’s Hubble Space Telescope and general astronomy concepts before doing a binary code nametag activity. They then participated in a hands-on “Recoloring the Universe” workshop created with Chandra, Google, and the American Astronomical Society (AAS) on the Pencilcode open access platform. The workshop was followed by an in-depth Q&A forum on astronomy, technology and women in STEM. Smithsonian Astrophysical Observatory conducted workshops with the Rhode Island Girl Scouts at Camp Hoffman in West Kingstown on August 2. The STEAM Discovery kick-off event was part of the Rhode Island governor's Million Women Mentors Initiative. Students were introduced to NASA Astrophysics missions and general astronomy concepts before discussing binary code for the "How to Talk to a Spacecraft" workshop, where the girls mapped binary code and created beaded pins and bracelets of their translations. NASA’s Chandra X-ray Observatory materials, including a new Women in STEM magazine, handouts on coding and 3D printing, and other lithographs were provided to all students in the camp as well as to Girl Scout administrators and other participants. Smithsonian Astrophysical Observatory ran workshops for visually impaired people at the National Federation for the Blind Youth Slam on July 26 and 27 at Towson University in Maryland. Students learned about stars and light before exploring the August 2017 total solar eclipse with NASA tactile/Braille booklets as well as the “Touch the Sun” activity. Dr. Wanda Diaz Merced demonstrated sonification of variable stars. Next, stellar evolution was introduced, with hands-on exploration of numerous NASA/Chandra 3-D printed models (Cassiopeia A, SN1987A, & V745Sco), including tactile/Braille panels on supernova remnants. Finally, the sessions ended with an exploration of a new Lego-based Cassiopeia A tactile model, with input solicited from the students, as well as a general Q&A session. Smithsonian Astrophysical Observatory conducted a session of coding in Providence, Rhode Island with Brown University’s ICERM Girls Get Math summer program on July 28. High school-aged girls and undergrad/grad teacher assistants were introduced to light, NASA’s Chandra X-ray Observatory, geometric models, and general astronomy concepts. Participants were involved in a binary nametag activity, the “Recoloring the Universe” workshop on coding & data processing, and did a Q&A session. Sonoma State University staff taught middle school-aged girls at Rosie’s Girls Summer Day Camp how to code using Turtle Logo. The camp is co-sponsored by the Rosie the Riveter National Historic Park and the YMCA of the East Bay. Each year many professional women participate in Rosie’s Career Day to demonstrate various career opportunities to girls. Smithsonian Astrophysical Observatory participated in the Rhode Island National Guard's student-focused STEAM Day at the Rhode Island National Guard Open House and Air Show at Quonset State Airport, RI. The event hosted students from high schools in North Kingstown, South Kingstown, Middletown, Newport, Portsmouth, and Tiverton. Smithsonian Astrophysical Observatory staff ran a demonstration for the students on stellar evolution using 3D printers and origami. Stellar evolution and supernova remnant infographic posters were handed out to educators, and students received handouts on working with NASA data and 3D printed objects. The Universe of Learning collaborated with the Association of Science and Technology Centers (ASTC) to provide access to NASA Astrophysics education resources at the American Alliance of Museums Annual Meeting. The project continues after the conference with professional development via online webinars. ASTC is identifying future potential sites and providing support in networking different sites together. Subject matter experts from the Chandra X-ray Observatory participated in the 2017 Cambridge Science Festival at the Smithsonian Astrophysical Observatory on April 23 with more than 800 visitors ages 4 to 84. Chandra discussions and demos centered around 3D visualizations and 3D printing. The 33rd annual national competition was held on May 20. Sixty middle-school state champion teams competed in 23 individual events, including Reach for the Stars. The Reach for the Stars event was supported by numerous resources, coach’s clinics and webinars developed by NASA’s Universe of Learning as part of NASA’s STEM Activation to help teams prepare for competition. On April 5, the Smithsonian Astrophysical Observatory worked with Brown University's YURT immersive environment technologists to import & manipulate 3D models of supernova remnants from NASA’s Chandra X-ray Telescope database. Local educators, technologists and a high school student from the Lincoln Academy in Providence attended a live demonstration. The demo explored multiple NASA data sets including Chandra SNRs, Hubble's Carina Nebula, and Curiosity's Mt. Sharp. Brown University is partnering with Chandra to translate the immersive 3D environment into a Google Cardboard/Oculus Rift personal 3D/ virtual reality environment. 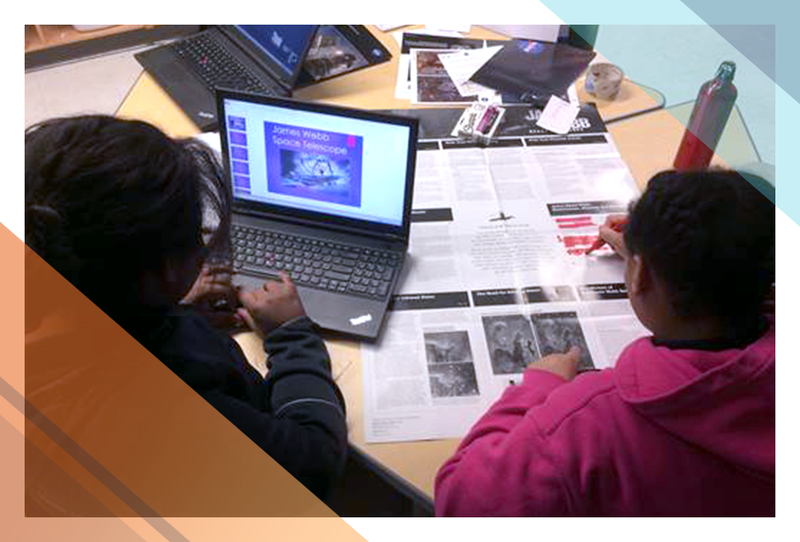 As part of the 15th Annual SMART (Science, Math and Relevant Technology) Girls Summit, Smithsonian Astronomical Observatory worked with Girls Inc. to lead workshops of Pencil Code/Recoloring the Universe in Lynn, Massachusetts. The electromagnetic spectrum, Chandra X-ray Observatory, and stellar evolution were introduced before running the hands-on coding workshop. Participants also received Chandra handouts. Follow-up coding activities with Girls Inc. Summer STEAM Program are being planned. The Smithsonian Astrophysical Observatory and the Tech Collective Women in Technology (WIT) group of Rhode Island organized a special screening of the film Hidden Figures on March 24. WIT arranged for ticket donations and bus fares for underserved schools and volunteered for logistics. About 275 local school-age girls attended along with dozens of teachers, parents and other attendees for a total audience of about 400. A question and answer panel discussion followed with local women in STEM: Gelonia Dent (Brown University), Zalyndria Crosby (CVS), Nupur Shridhar (Wheeler), and Kim Arcand (Chandra X-ray Observatory), moderated by Arcand's mentee, Cheyenne Figueroa, a local Providence high school student. Each of the 11 school districts represented was given a packet of NASA's Universe of Learning and NASA Astrophysics materials, including Women in STEM poster sets and coding activity handouts. The Universe of Learning’s Science Briefing “Women in STEM: Hidden Figures, Modern Figures” on February 2 featured a conversation with prominent women scientists and an introduction to the program’s projects and resources in an effort to inform the museum community about programming opportunities for Women’s History Month. The briefing, with over 50 Museum Alliance attendees, featured astronaut Cady Coleman and astrophysicists Julie McEnery (NASA/GSFC, Fermi) and Jedidah Isler (Vanderbilt University) in a discussion of their career paths. Community Engagement Specialist Jessica Kenney (STScI) introduced the panelists. Kim Arcand (SAO/Chandra) introduced an historical perspective on women in science and tech. She also shared the Women in STEM micro-website and poster series, which features women from the film Hidden Figures, among others, and the Recoloring the Universe coding activity. In featuring these resources, the briefing also announced the Girls STEAM Ahead with NASA initiative to the Museum Alliance community. The Universe of Learning collaborated with the Johns Hopkins Whiting School of Engineering on an after-school STEM event Barclay Elementary/Middle School in Baltimore, Maryland. Whiting plays a key role in the Barclay-Hopkins STEM Partnership, a 10-year investment to engage Barclay youth, teachers, and staff, with JHU faculty and students. The Whiting School of Engineering supports programs during and after school to help promote STEM education and strengthen Barclay Elementary/Middle School as a university-assisted, PK-8 STEAM community school. Students in 6th grade were invited to participate in the after-school activities. For three weeks, students were engaged in learning about NASA Astrophysics using field-tested, hands-on activities. Students learned about the tools and skills that astronomers and engineers use to study the universe.